A special greeting for a guest...a new way of looking at a familiarfairy tale...a day of exploration around your town. These simpleexperiences and activities help your child understand how to getalong with family, friends, and neighbors--from around the block toaround the world. * Easy to do and loads of fun! The Ready, Set, Learn series was created to help parents andchildren explore concepts and develop skills necessary to succeedin school. 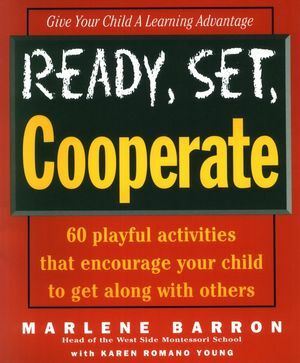 In addition to dozens of activities, each book containsa substantial overview explaining children's developmental needs.Also available in the Ready, Set, Learn series: Ready, Set, Readand Write; Ready, Set, Count; and Ready, Set, Explore. MARLENE BARRON, Ph.D., is Head of the West Side Montessori Schoolin New York City. She is the author of I Learn to Read and Writethe Way I Learn to Talk: A Very First Book About Whole Language, aswell as other books and articles. She has taught early childhoodeducation courses at several colleges, and currently is a professorat New York University. KAREN ROMANO YOUNG is a former editor at Scholastic. She hascreated educational materials for all ages, and has written for theNational Geographic Society and the Children's Television Workshop. A WHOLE WORLD OUT THERE. EYES, EARS, BODY, AND SOUL.